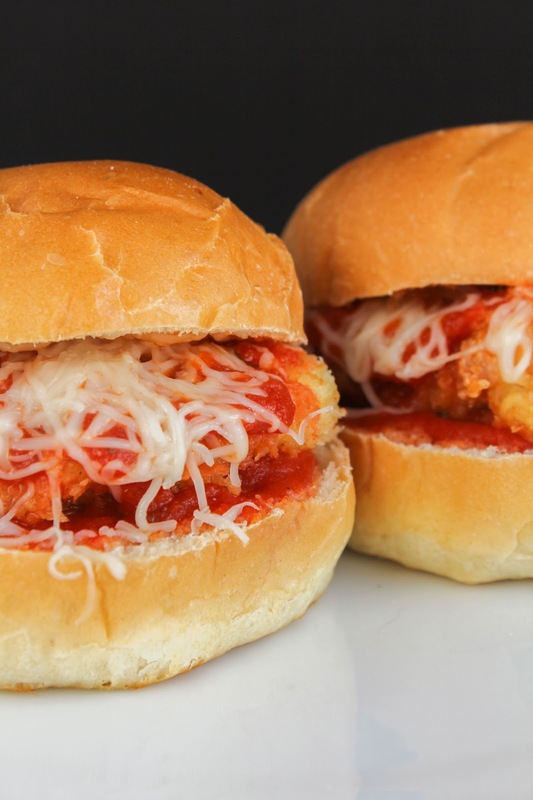 These fabulous and fun sliders feature lightly breaded and fried chicken, marinara sauce and melty mozzarella cheese. They are the perfect alternative to the classic chicken Parmesan dish! I love making a big dinner for my family on Sunday afternoons. I grew up having Sunday suppers with my parents every weekend. Meatloaf, chicken and dumplings, pot roast, we had all the traditional family dinners. I still like to cook those for my boys, but sometimes it's fun to do something different. Like having our favorite finger foods for dinner! Sliders happen to be at the top of my list for hand held meals. I make burger sliders, meatball sliders, even grilled chicken sliders. 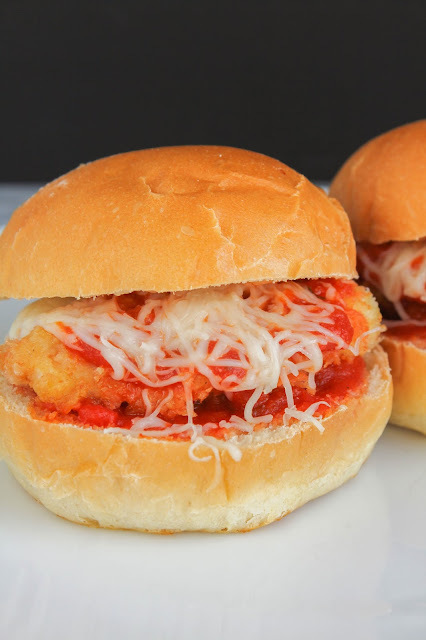 I love chicken Parmesan, so it's no surprise that my new favorite are these Chicken Parmesan Sliders. All the delicious flavors of the classic dish in sandwich form. Yes please!! 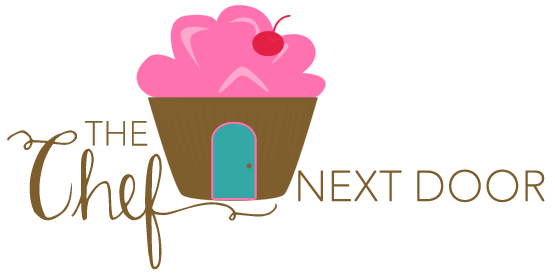 My Sunday Supper friends are sharing their favorite Finger Food Dinner Recipes this week! Be sure to check them all out at the end of this post. 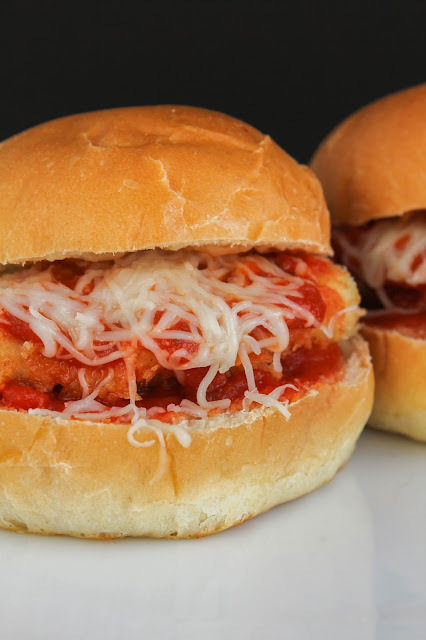 Are you ready to make some amazing Chicken Parm Sliders? Lets get started! Preheat the broiler. Add the flour to a shallow dish and season with salt and pepper. Add the eggs to another shallow bowl along with a tablespoon of water and mix well. Season with salt and pepper. Add the bread crumbs, garlic powder and oregano to another bowl and mix to combine. Dredge each chicken breast in the flour, then dip it in the egg mixture, then dredge on both sides in the bread crumbs. Pour the oil into a large saute pan and heat over medium-high heat. Add the chicken and cook until golden brown and cooked through, about 5 minutes per side. Transfer the chicken to a cutting board and allow it to rest for 5 minutes, then cut each breast in half. Arrange the bottom halves of the buns or rolls on a baking sheet. Put one tablespoon of marinara sauce on each bun, followed by a piece of chicken, another tablespoon of marinara, then a good helping of shredded mozzarella. Sprinkle with a bit of Parmesan. Broil the sliders for about 2 minutes, or until the cheese is melted. Top with the top halves of the buns and serve. #SundaySupper Finger Food Dinner Recipes!